Somewhere in the South Pacific a volcano slowly simmers and then bursts into fiery majesty, destroying all life that once clung to it. On a moonlit voyage a man ends his life by leaping over the rail of his passenger ship, neither his act nor his absence witnessed by anyone. In a small rowboat in the midst of churning waters a sailor pummels to death a victim we can barely see. Richard Bosman has never shied away from showing the horrors of life. Starting in the early 1980's he has depicted in both paintings and prints a variety of tragedies in dark urban settings, on rough seas, and in eerily quiet woods. His works have a rough-hewn vitality to them that clashes with their dark subject matter. There is a freshness to the imperfections and colors in these works. They enjoy a visual lineage to earlier artists such as Edvard Munch and Emil Nolde, both of whom oscillated between painting and woodcut printmaking like Bosman. Like Nolde's famous journey to the South Pacific in the early 20th Century, the ocean has left it's mark on Bosman. Born in India, raised in Australia, and the son of a merchant sea captain, Bosman has repeatedly returned to the setting of the sea. It is not surprising, since oceans have long stood as The Edge of the World. They are a place where storms swallow ships whole, where mermaids tempt sailors and where mythical monsters can be found. 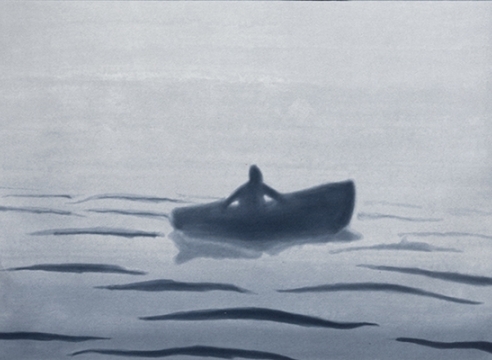 The ancient Greeks mysteriously called it "the wine-dark sea," and over the years Bosman's prolific output has explored its vast possibilities, its stories of both hope and oblivion. Bosman reveals to us that mankind is fickle, life is fleeting, and that the ocean remains unconcerned with our plight. There is a cinematic beauty to these works by Bosman. We sometimes feel as though we are looking at a film strip stopped in time, somewhere between cause and horrible effect. Works such as Volcano and Fog Bank are subtle in their ability to show the progress of time, but there are visual gaps in it, and it is in these gaps that much of the intrigue lies. In Night Sky the effect is almost imperceptible. Here, only the stars move, and in this movement we find we are disoriented. Both South Seas Kiss and Mutiny share the short-lived joy of shore-leave, as a captain is first enraptured by an island girl only to meet his demise once he turns his back. 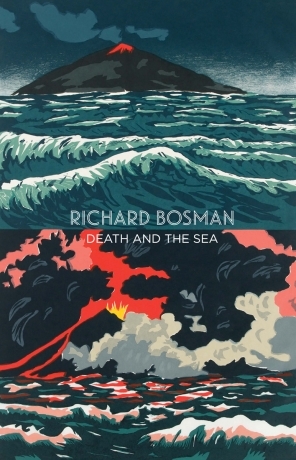 This exhibition is an exploration of Richard Bosman's love of the sea, and of the artist's use of woodcut, etching and linocut. It is also the maiden exhibition of Owen James Gallery, a new venture that seeks to span these same oceans. The gallery, based in Brooklyn, NY, will present work by both emerging and mid-career contemporary artists from an international perspective, with a special interest in artists from South East Asia. Given his international background and wide ranging interests in media and methods, the gallery is thrilled to be able to open it's doors with the work of Richard Bosman. Owen James Gallery is pleased to announce that our inaugural exhibition, Richard Bosman: Death and the Sea will open September 12, 2014, and is part of Greenpoint Gallery Night.